Where to stay in Knowlton to have the best of the Eastern Township. The B&B La Venise Verte is rated as 4 suns and offers 4 air-conditioned spacious country-style rooms and a lounge for our customers’ exclusive use. Stop for one night or longer, in this beautiful 1884 Victorian home located a minute away from the village and a 10-minute walk from Brome Lake. They offer a non-smoking environment, a warm welcome and a peaceful atmosphere. During the summer, relax in the garden and take a swim in the pool. Rooms start from $95 per night with generous breakfast. 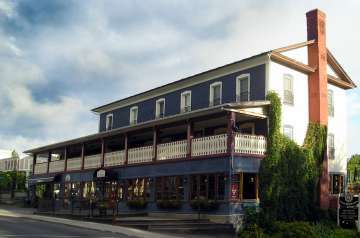 Recognized by Fodor’s travel guide as one of the Eastern Townships favorite destinations this centrally located historical building has 12 uniquely decorated rooms starting at around $110 dollars per night. They have special rates with breakfast included and many package deals that include golf games and tours. Fodors Travel Guide once rated the historical Auberge Knowlton as one of the best places to stay Knowlton. Auberge Knowlton, one of Knowlton’s historical landmarks. A cozy and tranquil night is assured at this charming inn which boasts having a world class chef on hand to create wonderful meals. 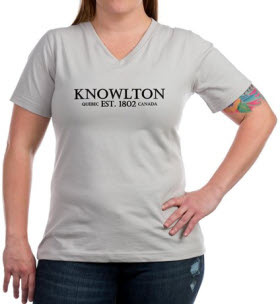 A library, sitting room and large fireplace make this an excellent place to experience all of Knowlton’s hospitality. They have a large swimming pool and are close to Brome Lake on a large acreage nestled in the forest. Rooms start from $110 per night and they offer many packages including golf and cycling. 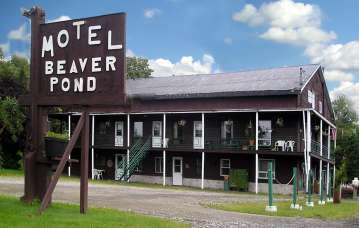 For the budget traveler the Beaver Pond Motel is ideal with rooms starting at rooms for 1 = $55 and rooms for 2 = $65 per night. Feeling like an old-fashioned ski lodge or hunting lodge the no-frills motel has a shared kitchen and rooms can be rented nightly, weekly and even monthly. While it only has a one-star rating Lucille is a very friendly host! Located across from The Thirsty Boot, one of Knowlton’s well known Pubs. Beaver Pond Motel in Knowlton.